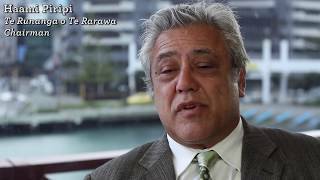 He Whakaputanga – the Declaration of Independence of the United Tribes of New Zealand – may be small in size, but it is hugely important. New Zealand’s first ‘constitutional document’, it was how rangatira (Māori leaders) told the world, back in 1835, that New Zealand was an independent Māori nation. Patuone signed He Whakaputanga sometime between 29 March 1836 and 25 June 1837. In 1840 he signed Te Tiriti o Waitangi. I te taenga mai a te Pākehā he iwi rangatira te iwi Māori. Nō tēnā hapū, nō tēnā hapū te mana whenua me te rangatiratanga. Kāore i eke te ture Pākehā ki ēnei motu. Nō reira, he pukapuka whakaatu ki ngā rāwaho he whenua rangatira tēnei, he whenua Māori. I whakaaetia e Ingarangi tēnei Whakaputanga Rangatiratanga. Nō konā, e tika ana me whakarite tiriti ngā rangatira Māori kia tū ai he kāwana Pākehā ki tēnei whenua. Koia tēnei ko Te Tiriti o Waitangi i te tau 1840. Kua pūmau rawa atu te iwi Māori ki ngā kupu o tēnei pukapuka tapu i runga i ngā marae maha huri noa i te motu, arā, e tūturu ai te rangatiratanga, me te mana motuhake o te iwi Māori. Described by British Resident James Busby as the ‘Magna Carta of New Zealand Independence’, He Whakaputanga was a bold and innovative declaration of Indigenous power. He Whakaputanga is New Zealand’s first ‘constitutional document’ — a document that defines the existence of the nation, who is in control of it, and how it will be run. It is also one of the earliest assertions of Māori identity beyond separate iwi and hapū. The word ‘whakaputanga’ is usually translated as ‘declaration’, but it can also mean ‘emergence’ — the emergence of a new country. The words used in the document to describe an independent state, “he whenua rangatira”, also have a deeper meaning of a land at peace under its rightful owners. He Whakaputanga – Whose hand was it that crafted these words? Ki te kore He Whakaputanga, tērā pea kāore i puta mai te Tiriti o Waitangi. Haere mai ki te ako kōrero anō, ki He Tohu. Without He Whakaputanga, there may never have been a Treaty of Waitangi. Come and find out more, at He Tohu. He Whakaputanga — Nō wai te ringa i auaha i ēnei kupu? He Whakaputanga — Whose hand was it that crafted these words? Rewa (also known as Manu) signed He Whakaputanga with his brothers Moka and Wharerahi. An important ally of Hongi Hika, Rewa was a well-regarded leader of Ngāpuhi’s northern alliance. His support for the mission stations at Kerikeri and Te Waimate helped them survive, and he was a driving force behind the 1831 letter to King William IV. The final Māori text of He Whakaputanga was written by Eruera Pare Hongi, who also composed the first known independently-written letter in te reo Māori in 1825, when he was only 10 years old. See the original He Whakaputanga, Te Tiriti and the Women’s Suffrage Petition. Explore the stories of He Whakaputanga, and get to know the people who signed the document. "People often think that you know Māori are just sitting on the shore waiting for Abel Tasman or James Cook to turn up but that's certainly not the case." Vincent O'Malley, Ngahuia Te Awekotuku, Anne Salmond, Haami Piripi, Mānuka Hēnare.